The 'Box Set' includes a Player's Book, Storyteller's Handbook, interactive character sheet, an adventure (Eve of Judgement) and a Storyteller Screen - all you need to get up and running! Publisher's blurb: "Imagine being both dead and deathless at the same time. Imagine being cradled in the arms of death for years, sometimes decades on end, but all the while knowing that you will eventually not only arise again, but awaken to an unfamiliar world that mostly fears and hates you. Now imagine that your purpose, your entire existence, is bound within this cycle - that you are chained to it for all eternity. You sleep, you wake, your serve your Judge's will in the lands of the living, and you return to the death-sleep once more. The ancient culture that empowered you is gone, lost to the sands of time... yet you endure. 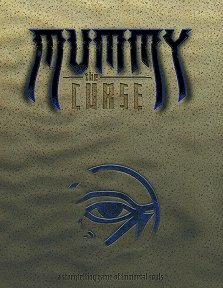 "In Mummy: The Curse, a Storytelling game set in the World of Darkness, you play one of these beings. Those who know they exist, from the cultists who serve them to the dark forces arrayed against them, call them the Deathless.